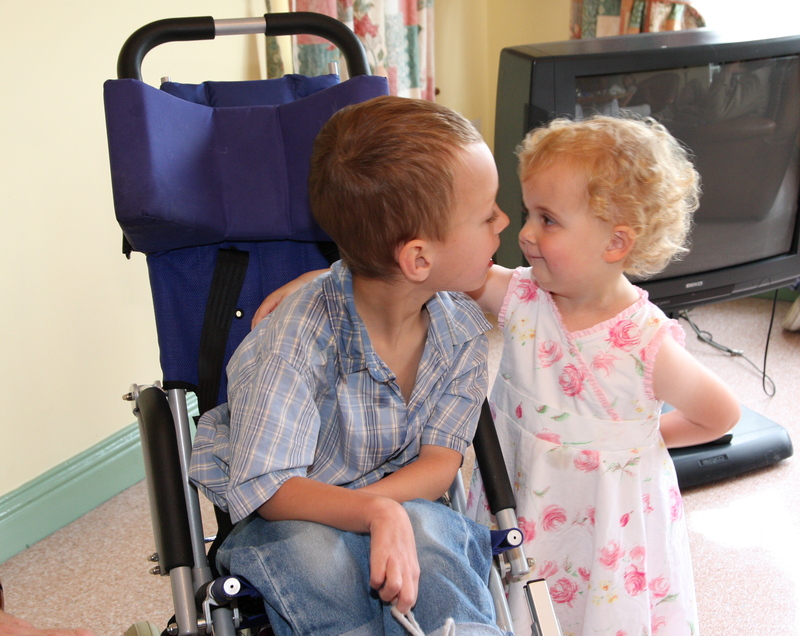 Aidan’s mobility journey has been long, complex and emotional. I’ve learned a few things along the way that I want to share with families and professionals who are considering a wheelchair for their child/student/patient. Please follow the links through for more information and check out the amazing video of Aidan’s progress. Functional, independent mobility in children with disabilities has been shown to improve cognitive and perceptual skills, reduce learned helplessness, increase confidence, and increase participation with their peers in everyday activities…. Parents of children with disabilities and some medical professionals are under the inappropriate assumption that the use of PM (power mobility) will interfere with the development of the skills required for walking or eliminate the child’s desire to walk. However, in reality children often become more interactive, motivated, and agile when PM is applied. Also, choosing a wheelchair is a very child specific process. We made the best decision for Aidan but that doesn’t make it the best choice for every child. Age 1 – Kid Kart Seating system with stroller base. He was little and undiagnosed and we had no idea if he would develop into a walker or roller or neither. This swanky stroller gave him the support he needed to sit upright, participate in family activities, and get out and about. 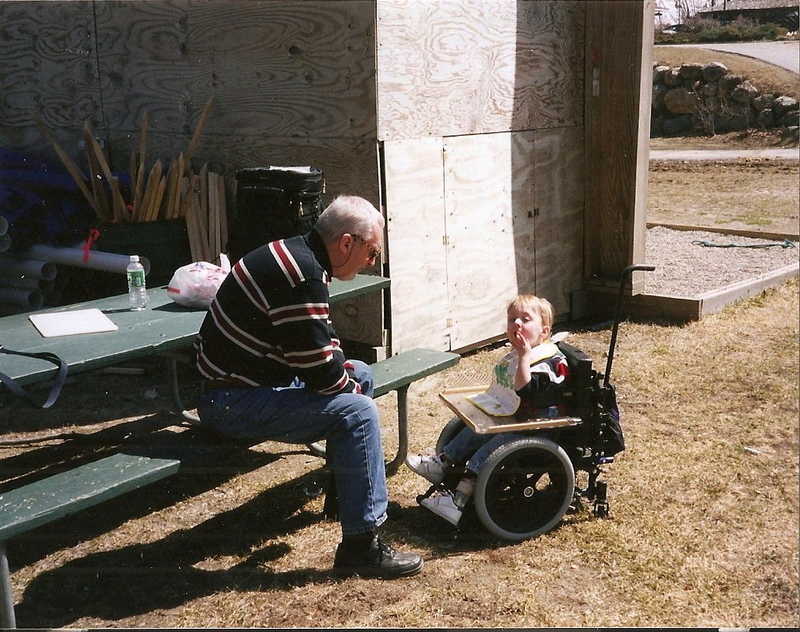 Age 3 – Quickie Kids wheelchair that we pushed around. This was a low wheelchair that put him at the level of his peers in preschool. 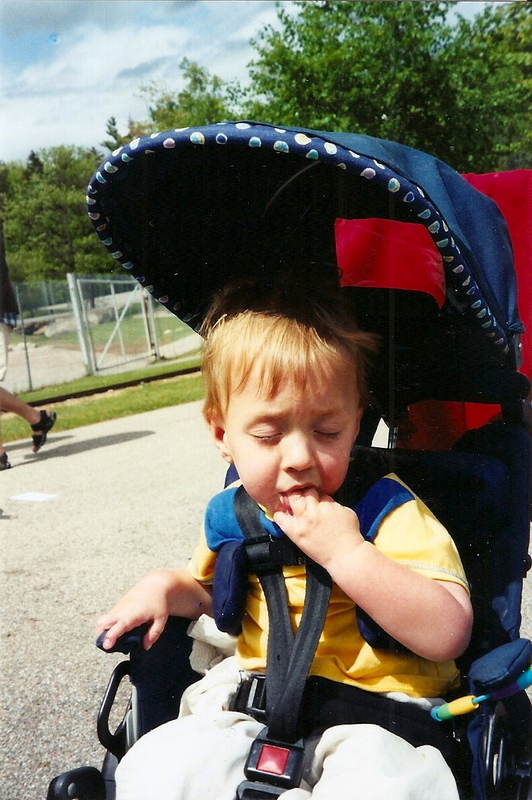 Age 6 – In an effort to minimize the wheels and maximize the walking, Aidan then got a stroller that was not intended to be a positioning chair. It was collapsable and lightweight enough for my seven year old to throw in the back of the car. In school Aidan transferred to a Rifton chair that supported him for classroom activities. Aidan walked short distances. I was not emotionally ready for a bigger wheelchair because it seemed like a big CAN’T and we didn’t have the proper vehicle for it. Age 10 – It was time to buy another chair. I thought he could perhaps move a manual chair a little bit, maybe enough to scoot himself closer to a table or turn toward his friends. The rest of the time we would push it for him. When we took him to be evaluated, we put him in both a power chair, which we were NOT seriously considering, and a manual chair. Please watch this video to see what happened, and also note that the first clips you see of Aidan in each chair is the first time he ever sat in it. So, yes, I learned my lesson. Never say never. Manual vs. Power – They are obviously very different. I wrongly believed this was a black and white decision which is why I didn’t fully consider a power chair for Aidan. Instead, we had to carefully weigh the pros and cons of the manual chair and power chair which took time. Time to Learn – The yellow power chair in this video was a loaner. We had it for three months, which is very unusual. I believe that every trial should last for AT LEAST two weeks. The chair needs to be trialled in different environments with different adults giving input. The child needs to be given an opportunity to learn and the family needs time to make such a huge financial, emotional, and logistical decision. Most trials last only a few days with two weeks being considered a generous amount of time. We were able to get a longer trial because our saleman and DME guy are fabulous and because no one else needed this particular chair at the time. IF WE ONLY HAD A TWO WEEK TRIAL WE WOULD HAVE SAID NO TO THE POWER CHAIR AND AIDAN’S QUALITY OF LIFE WOULD HAVE BEEN GREATLY DIMINISHED. Did you catch that? We would have said no. Why would we expect anyone to demonstrate mastery of such a complex motor and cognitive task in such a short amount of time? While the professional recommendation is that a child demonstrate “emerging skills” to qualify for a power chair, how much is enough? Knowledgable professionals – You’ll want input from your PT, school team, and experienced sales rep. Make sure you are working with a PT who is knowledgable about your child and wheelchairs. For us, this was actually two PTs working closely together. Some PTs may opt out of this process when they are not compensated for the time it takes to do the extensive paperwork. Here are some reasons our insurance denied our chair at first, prompting our PT to write and re-write letters of support. Finances – There are real financial barriers to getting a chair. Sometimes they are not covered by insurance or may include a battle of paperwork to get them covered. There may be maitenance costs. If you are getting a power chair, the cost of an accessible van is exorbitant. This is the time to ask for help. Check out our fundraising page to learn more. Accessibility – Does the wheelchair fit where it needs to go? Do any home modifications need to be done? Does it work in the school setting and do you have support of school staff? Emotions – This was the biggest challenge for me. Getting a wheelchair for Aidan made me feel like we were giving up on walking. I was afraid it would make him look so….disabled. Sedentary. Dependent on a cumbersome piece of equipment. The exact opposite turned out to be true. Aidan was suddenly able to go where he wanted to. He had power and independence and freedom. We celebrate that every day. Are we done yet? Actually, no. As is shown at the end of the video, since getting a power chair, we were able to get Aidan a second hand manual chair for use inside the home and he still walks in a walker at school. He deserves the opportunity to be mobile in any way that works for him with any assistance necessary and that is not always limited to one piece of equipment. It’s not too soon and it’s not too late – Studies like this one and this one show that babies as young as 11 months old can learn how to use a power chair. Considering that is the age that babies tend to start walking and exploring their environment, it makes perfect sense to assist a child with significant mobility impairments to do the same. Check out this amazing story about Go Baby Go and how this team is using toys to get little kids moving. The ZipZac chair is also made for early movers. I’ve made the best decisions I could regarding Aidan at any given time, but having seen the incredibly positive impact independent mobility has made on his life, I wish I had gotten him his power chair sooner. It has been the Best.Decision.Ever. If you have any questions or need any encouragement in this big decision, please don’t hesitate to contact me.